This one-pot meal is fit for a weeknight because of its easy preparation and cleanup. Many commercial sausages contain garlic and onion, but this recipe recreates the sausage taste without those pesky FODMAPs. In a small bowl, combine chopped fennel seeds, smoked paprika, oregano, red pepper flakes, ½ teaspoon salt, and pepper. In an extra-large skillet over medium-high, warm the garlic-infused oil. Add red bell pepper and sauté until peppers turn dark brown in spots, about 3 minutes. Push the peppers to one side of the pan and add the ground chicken, spreading it over the pan. Leave the meat undisturbed to brown and sprinkle it evenly with the spice mixture. When chicken is browned on the bottom, work spices in by folding and chopping the meat with a spatula. Continue to sauté the meat until it is no longer pink, for a total of 7 to 9 minutes. Add leek leaves, mix in peppers from the side, and stir until crispy bits (fond) form on the bottom, about 2 minutes. Stir in the water, vinegar, mushrooms, and remaining ½ teaspoon salt. Bring to a boil, scraping the pan bottom to deglaze (loosen fond). Add pasta evenly to the pan and press down to submerge. Begin timing the pasta, less several minutes than recommended on the package. Cover the pasta completely with kale leaves, but do not stir them in. Adjust the heat to maintain a strong simmer. Cook, pressing down gently on the kale 2 or 3 times until the pasta is nearly done (taste-test a piece). This will take 7 to 13 minutes depending on the brand of pasta. 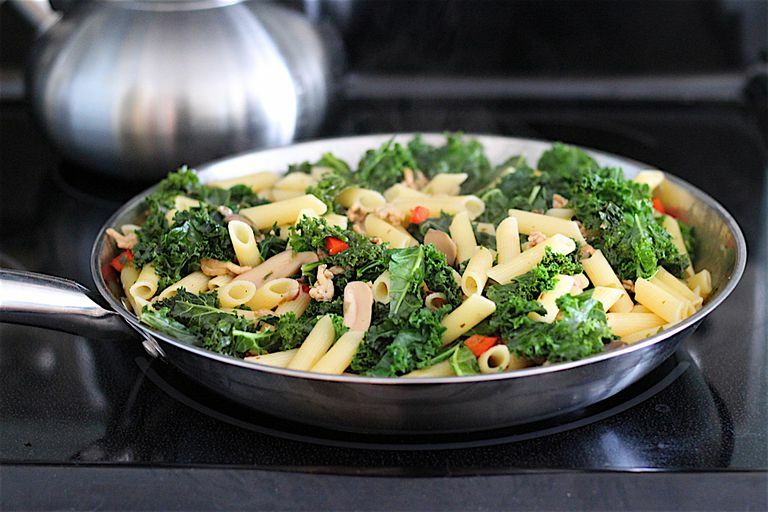 The kale acts like a lid on the skillet, holding steam in as the pasta cooks. Gently stir in the kale. If the water is absorbed before the pasta is done, add more water ½ cup at a time and continue to cook. Remove from heat and adjust seasonings to taste. Top with the grated parmesan cheese, and serve. Use sausage without garlic or onion in place of chicken, if you can find it. Slice it into thin rounds before adding it to the skillet. Use half a cup of thinly sliced scallion greens in place of leek leaves. Make sure to stick to the greens only. Use collard greens (stems removed), or Swiss chard leaves in place of kale. Canned mushrooms are not created equal. Avoid the cheapest brands; they are not nearly as tasty. The amount of mushrooms called for in this recipe, ¾ cup drained, is the yield from a 7-ounce can, which may also be described as “4-ounce dry weight” on the front of the package. Gluten-free, low-FODMAP pasta can go from done to overcooked in a minute; set a timer for 75 percent of the total cooking time suggested on the package and begin testing for doneness every minute thereafter.